Here’s an easy vegetable recipe list with some really delicious quick and easy vegetable dishes. You can prepare them with the use of some fresh veggies from your garden. These are perfect for appetizers and can also help raise your metabolism. Directions- Preheat the oven to 425 degrees F. Heat half of the oil in a large frying pan and cook the onion for 5 minutes. Add the garlic and lentils and cook for 1 minute. Add the stock and bring to the boil. Cover and simmer for 25 minutes while stirring occasionally until the lentils are tender and the liquid is absorbed. This recipe is one of the best vegetarian flan recipes and I had to include it in my easy vegetable recipe list. This vegetable dish is filled with vitamins and nutrients and is a perfect winter meal. Directions- Preheat the oven to 400 degrees F. Pour the oil into a roasting tin and place in the oven until smoking. Add the courgettes, peppers and onion. Roast for 30 minutes. Sift the flour and salt into a bowl. Rub in the margarine until breadcrumb consistency. Stir in 3-4 tablespoons of water until the dough is smooth. Chill for 20 minutes. Remove the vegetables from the oven and add the tomatoes. Stir and let cool. Lower the oven temperature to 375 degrees F. Roll out the pastry and line a 20 cm/8 inch fluted flan tin with greaseproof paper and baking beans. This is a really easy vegetable recipe and a nice homemade sauce as well. Directions- If you’re using fresh tomatoes, place them in a saucepan of boiling water and boil for 1 minute. Drain, peel and chop while reserving any liquid. Heat the oil in a deep frying pan over a medium to high heat. Add the garlic and onion and cook for 4 minutes or until soft. Add the tomatoes, wine, herbs, pepper and salt and bring to the boil. Simmer for 35 minutes if using fresh tomatoes (20 minutes if canned). Leave to cool and then refrigerate for up to 3 days. For longer-term storage, freeze in portion sizes ready to defrost and use. It can be kept frozen for 4-5 months. All herbs contain healing properties including rosemary. Potatoes are a good source of vitamin B and C along with some other nutrients that promote healthy skin. Directions- Preheat the oven to 350 degrees F. Make 1cm/ ½ inch cuts in each potato, slicing about 3 quarters of the way through. Combine the potatoes with the oil in a large baking dish and sprinkle with salt and pepper. This casserole is very delicious and quite easy to make. You can prepare it within 30 minutes. Directions- Cut cheese into cubes and place in a saucepan with ¼ cup butter. Heat over medium until melted and smooth while stirring often. 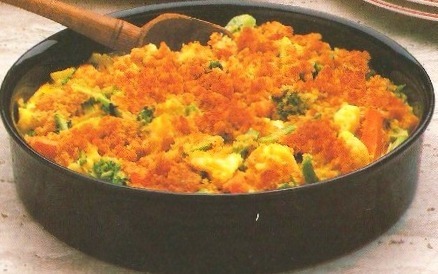 Place vegetables in a 1 quart casserole dish. Pour cheese mixture over and mix well. Melt remaining butter and stir in cracker crumbs. That’s my easy vegetable recipe list. These veg dishes in my easy vegetable recipe list are delicious, especially with the use of fresh vegetables.